Last week ended with the metals on the rise, rather substantially, and everyone is hopeful that this trend continues throughout this week’s Long Beach Expo, open on Wednesday for dealers and Thursday for collectors. Gold is currently at $1,245.50 and Silver is $16.45. Bags of circulated Silver Dollars wholesale for $23,850 as long as they are VG and better. Ninety percent Silver bags are trading at $12,410. Heritage Auctions will host the Long Beach Sale with several rarities looking for new homes. For the advanced collector looking for an affordable rare coin, there is a 1794 Flowing Hair Dollar in NGC VG10; this coin has an FMV of $109,380 in VG8. 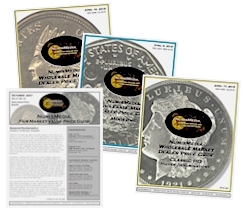 This was the first year of regular issue silver coins to be produced at the U.S. Mint. Below are some of the other potential highlights of this Heritage sale. 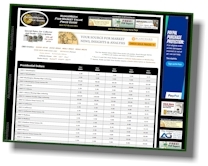 The overall market continues to correct with lower prices in most series. However, there are still enough increases for specific coins to encourage buyers and sellers. The 1909 S Lincoln Cent in MS66 Red has a higher Market this week at $2,575 and the 1909 S VDB in MS65 Brown is up to $2,275. The S VDB is a date that is rather plentiful in the marketplace in MS64 and lower grades; higher grades are more difficult to find at reasonable price levels. High grade coins in full Red are not easy to locate and typically require premiums to attract sellers. The 1912 D Red in MS66 is a prime example and has jumped to $8,125 Market. Now that abundant supplies of the 2016 Mercury Dime Gold coin have hit the market, prices have begun to settle. 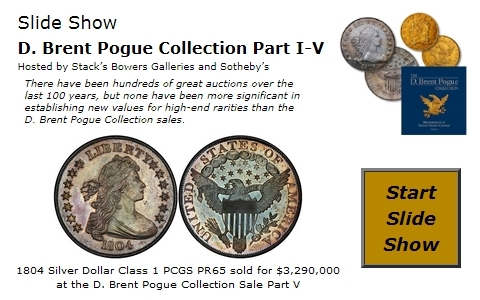 Coins in the original government packaging are trading at $225 to $235; the SP70’s are right around the $275 mark. Dealers are anticipating that this market will get a second shot of momentum once the 2016 Standing Liberty Quarter Gold coin is available later in the year.